This Christmas stocking is made for us in Europe from the finest European velvet and long faux fox fur on the cuff. The cuff is snow white and the body is a deep, dark burgundy that appears to be almost black under some lighting. The feel of the stocking is extremely soft and luxurious to the touch. Measured along the diagonal from the top left hand corner to the toe, the stocking measures 21 inches, and the width of the cuff is 7.5 to 8 inches. This stocking will make a set with out other 21 inch European velvet stockings which are usually available in blue, black, green and burgundy with long fox cuff. 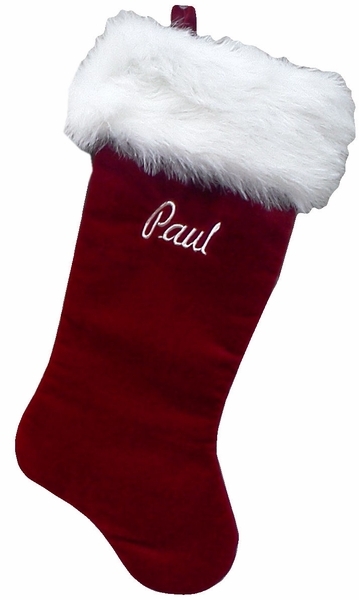 Names can be personalized on the body of this rich Christmas stocking with GOLD metallic embroidery thread or SILVER metallic embroidery thread to compliment the luxurious feel of the velvet material. If you are ordering multiple items, enter names separated by comma like this: Jenny, Joe, Dad, Mom. We will understand that it means one name per item purchased. If you are ordering a large quantity of items and all names do not fit into personalizing box, you can also use a comments box in the checkout area or fax us a list of names.